Why personal accounts of cancer treatment in Scotland matter: re-blogging a post for Macmillan Cancer Support Scotland by Prof Mary Wells. The publication of the personal patient accounts from the Scottish Cancer Patient Experience Survey provided instant publicity thanks to national media coverage but only reflected a fraction of what was in the report. Compiled from an independent analysis of over 7,000 comments made by more than 2,500 people with cancer, these personalised responses are the stories of individuals whose experiences provide an insight into what matters most to people with cancer from diagnosis to end of treatment. Whilst the results of the multiple-choice survey questions, published in June, provided an indication of the aspects of care which are experienced positively and those which leave room for improvement, they provide little detail of why or how individual patients experience those aspects of care. Every year in the United Kingdom around 200 000 children start smoking. Half of those who try a cigarette will become regular smokers, putting themselves at risk of tobacco related diseases that can shorten their lifespan by at least a decade. Because of this, the UK and other governments have implemented a range of tobacco control measures over many years, which are intended to both prevent smoking uptake and encourage smoking cessation. Key among these have been measures to restrict the ability of the tobacco industry to market their products to new and existing smokers. What does an old children’s rhyme, a mouse, a clock and a tale of men including migrant workers with learning difficulties, have to do with my research into clinical trial design? The common factor is that “all” of these groups, grannies bouncing babies on their knees, people with learning difficulties, migrant workers, are, like many of us, people who may need medical treatment and can benefit from clinical trials. Sadly, many of them will be excluded. Trials have been around a long time. Hickory dickory dock is reputed to date from 1744 shortly before James Lind, a ship’s surgeon on board HMS Salisbury, started his famous scurvy trial in 1747. He treated 12 sailors, two in each group with cider, sulphuric acid, usual gruel, sea water, vinegar and oranges and lemons – sailors barely able to walk, lying in their bunks with rotting bleeding gums. After six days, one sailor on oranges and lemons, was fit for duty. And as they say – the rest is history – fresh citrus fruit became part of the staple diet in the Royal Navy. Enter the mouse – also on the ship. A pure beautiful white mouse is often the first for experimentation to determine if an intervention is safe before trials on humans. From Mice to Men, we progress through early phase trials that test safety and toxicity of a drug in a normal population to calculating safe doses and side effects in a diseased population. All of this work is essential and well regulated to protect patients, but we also need to know if a treatment will work on “all” patients who will ultimately receive the treatment in usual care. The clock is split into nine: moving clockwise, trialists consider different aspects of the trial. Who is chosen to participate in the trial? How are they enrolled into the trial? Where is the trial being done? What expertise and resources are needed to deliver the treatment? How should the treatment be delivered? What measures are in place to make sure participants comply? How closely are participants monitored? How relevant is the outcome or result to participants? To what extent are all data included? If, for instance, the people designing the trial think: everyone who might get the treatment in routine care will get into the trial; and they will be invited when they attend a clinic at their usual health centre or hospital; they could be treated by any of the doctors, nurses, physios; and they go back to see the health care professional as often as usual to measure something important eg improve attention in children with Attention Deficit Disorder; then we have a large coloured in clock. If we move away from the norm, then a smaller clock, with less colouring in. Over eighty international trialists have helped develop this tool to help trialists think through the who, where, how, when of their trial. The “clock” format is very visual – at a glance, you can tell how much a trial equates to the “real world”, how applicable the results of a trial are to usual care; lots of colour then very like the real world and if not much colour then the trial is looking at specific well controlled ideal conditions for particular people or settings. The trial design tool is fun for trial teams to use using paper or the web; a different way of working, improves discussion through making trial teams aware of the range of opinions and facilitates consensus. It aims for consistency in decision making. Why is this important? Patient and context are key to determine if a trial can answer the question from a patient, doctor or policymaker’s perspective “Does this help me?” An innovative treatment can be the difference between life and death, consequently clinical trials are deadly serious. And expensive – medical research charities invested over 1.3 billion in UK medical research including trials in 2013. Thus, considering trial design and applicability of trial results has never been more important. We owe it to the British taxpayer to improve the health of the British public with well-designed trials and this tool has an apt acronym PRECIS-2. PRECISely when needed, this tool can help design trials from mice to men that are relevant and fit for purpose. Kirsty Loudon is a Research Fellow with the NMAHP Research Unit at the University of Stirling. Update of a post published in the College bulletin, University of Aberdeen, July 2015. “Research demonstrating the value and impact of our vital education work has been published in Pycho-Oncology, the Journal of Psychological, Social and Behavioural Dimensions of Cancer. Community Nursing has the potential to reach a variety of individuals and provide a service which demonstrates a nurses compassion for rehabilitation and symptom management. 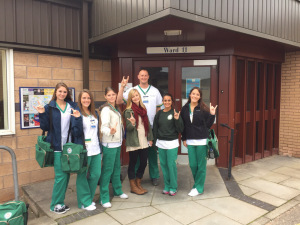 Day 1 of clinical’s were centered on immersing ourselves within a different culture (Scotland) and fully grasping the concept of community nursing and what it entails. 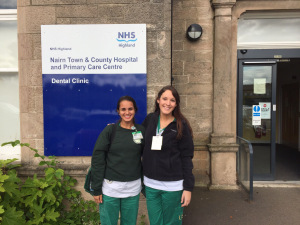 We had the privilege of being dispersed into multiple NHS Community Nursing facilities and rounding with the community health nurses.The facilities included East and West Inverness, Nairn and the Mental Health Assessment Team (MHAT). What makes an outstanding graduate nurse? 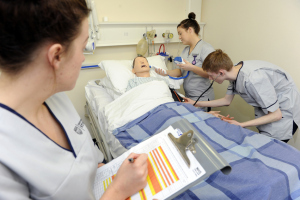 What key attributes and qualities will distinguish graduate nurses of the School of Health Sciences, University of Stirling? Dr Cari Malcolm has blogged about our Curriculum 2016 development – she’s asking students and graduates and would like to hear from you! We all know changes are afoot in terms of health and social care requirements and provision. Over the next decade care will continue to become more community and primary care-based with less and less focus on hospitals. Our population will continue to grow and age and care requirements will become more complex as we live longer with multiple long term conditions. Technology will continue to advance at an exponential rate yielding growth of new technologies and the increased emphasis on e-health. All of these factors give us reason to consider what skills our future nurses will require to practice in such a dynamic and ever-changing health and social care environment.